Assembly Members in the Birim Central Municipality of the Eastern region have participated in a day’s capacity building workshop on the District Assembly concept and local government operations. It was aimed at refreshing the minds of the participants on the decentralization concept and local governance system to help champion and promote the operations of the District Assemblies. 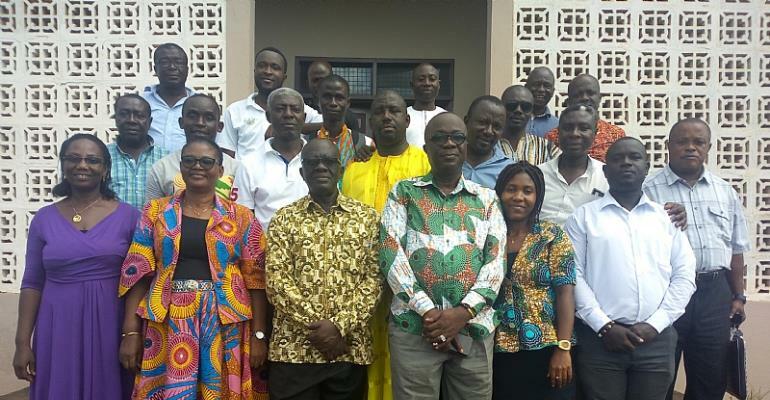 In a presentation, the Eastern Regional Economic Planning Officer, Mr. Jonathan D. Awuah, said lack of requisite knowledge of Assembly members on the operationalization of the Assembly concept made it difficult, particularly in the areas of scrutinizing Assembly’s budgets and project documents. The participants were taken through topics such as the functions of the District Assembly, a composition of District Assembly, functions of the various sub-committees, the structure of the Assembly, types of committees and the model standing orders. Mr. J.D. Awuah urged them to keep abreast with the legal instrument of the Assembly concept, to empower themselves and enable them to contribute effectively at Assembly sessions. He regretted the lack of substructures in many of the districts in the country and urged the participants to advocate for the creation of the substructures since they were the means for full and effective participation at the grassroots. He urged the Assembly members to work effectively with the unit committees to monitor contractors, draw community action plans and use it to advocate for development instead of always relying solely on the District Assembly. Schooling them on their roles and responsibilities, the resource person mentioned that as Assembly members, they represented their constituents and were expected to present their concerns to the Assemblies and vice versa. He said they were expected to educate the electorate on government policies and Assembly programmes and projects, lobby the Assembly for development projects in their electoral areas, participate actively in Assembly and sub-committee meetings, liaise with public and private institutions to attract resources and assistance and take part in communal and development activities in their respective communities. The Human Resource Manager of the Assembly, Ms. Christiana Dugbazah explained in an interview that, Assembly members are at the heart of the decentralization system hence her decision with management to organize the programme to equip them with the requisite knowledge and skills about the operations of the District Assembly to function effectively. She said as representatives of their electoral areas, Assembly members ought to work diligently devoid of political colourisation to improve on the general living conditions of the people. When quizzed on her next capacity building training for the Assembly members, Ms. Dugbazah said the knowledge acquired today by the Assembly members and its effective utilization at the Assembly would determine her next line of action. She, however, expressed worry about lack of requisite knowledge and skills of some of the Assembly members on the operations of the Assembly and called on management to periodically release funds to organize such programmes to build their capacities.